Tom Montalbano was hired by the Weehawken school district two years ago to be a social studies/United States history teacher and coach at Weehawken High School. It may turn out to be one of the best hires in the district’s history. Without seeing Montalbano perform in the classroom, it’s hard to judge him as a teacher. But as a coach? His record right now is as stellar as it gets. You see, Montalbano is an assistant football coach and head wrestling coach. He was brought in from Bergenfield High School by the district’s vice-principal, athletic director and now former head football coach Nick DeStefano to be part of his coaching staff. But Montalbano had an idea, one that was echoed by the school and township leaders. “There had been a strong desire from our administration to have our own wrestling team,” Montalbano said. For many years, Weehawken had been forced to compete with strictly co-operative programs. For years, it was a co-op with Secaucus and in later years, Bogota. In fact, Weehawken had not fielded its own wrestling team in more than 25 years. At one time, the Weehawken wrestling team was a powerhouse, coached by the legendary Hudson County Sports Hall of Famer Howard “Laddie” Wolf, who has since passed on. But since the early 1990s, there has not been a Weehawken wrestling team. It was always part of someone else’s routine. If Weehawken kids wanted to wrestle, they were forced to travel to either Secaucus or Bogota in any form imaginable. At one time, the Weehawken wrestlers traveled by taxi cabs to Secaucus to and from practices and meets. In recent years, they were shuttled to and from by a bus. But still, there was a major inconvenience to travel to northern Bergen County every day simply to wrestle. 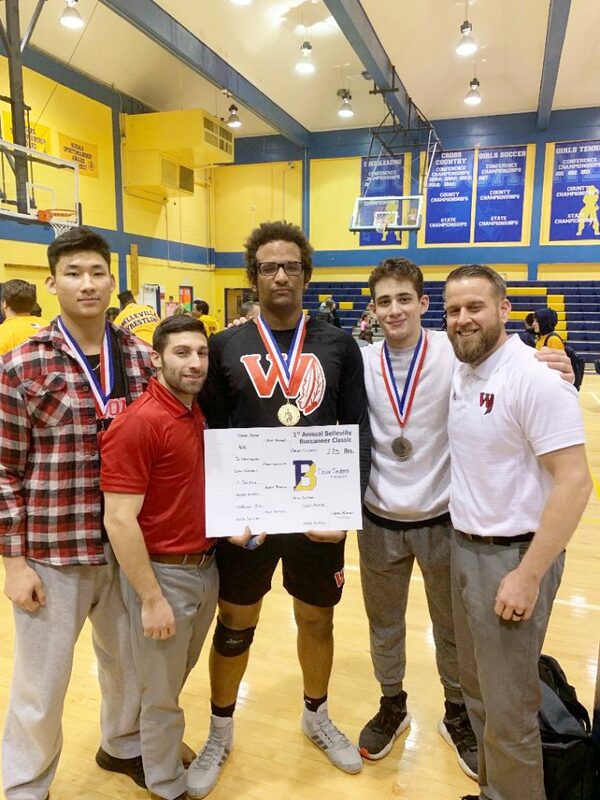 But Montalbano believed that wrestling, on its own, could actually work in Weehawken, which happens to be the third smallest school in the NJSIAA North Jersey Section 2, Group I landscape. “The administration decided to give us the tools and the materials we needed to make it happen,” Montalbano said. So the co-op with Bogota was terminated. Weehawken is a district that was rumored to be considering dropping football a few years ago because of a lack of participation. Now it was going to try wrestling? Were there enough kids to field a full team? Montalbano didn’t know until he held the first introductory meeting last spring. He was blown away by the attendance. “We had 35 kids who signed up to participate,” Montalbano said. Wait a minute. Group I schools don’t get 35 kids to turn out for anything and that includes a free pizza party. There was a time in the state of New Jersey that football and wrestling were almost synonymous. Plain and simple, if you were a football player in the fall, you wrestled in the winter. You lifted weights in the spring and summer to get bigger and stronger for football and wrestling. It was all part of the natural cycle. But that’s not so much the case any longer. In today’s day and age of specialization and asking student/athletes to concentrate on one sport, football and wrestling are drifting apart. Just how big did wrestling become in Weehawken? Well, for one, the district now owns two sets of mats, a practice set located at Woodrow Wilson School and the match set at the high school. There’s a youth wrestling program for aspiring wrestlers in sixth, seventh and eighth grade. There’s a wrestling club for the high school wrestlers not on the Weehawken varsity. It’s the real deal. Montalbano needed to be in the high school as a teacher to make it all happen. And this season, for the first time in three decades, Weehawken has its own wrestling team. And even more shockingly, the Indians are winning. As of Jan. 17, the Indians were proud owners of a 6-5 record, coming off three straight wins over Wood-Ridge, Newark East Side and Becton Regional. The Indians are currently sitting in third place in the NJIC-Division 4 standings and are currently in position to earn a berth in next month’s NJSIAA state sectionals. Yes, for a first-year program. And people think that the Miracle on the Hudson took place with a plane 10 years ago. It just might be taking place on wrestling mats in Weehawken. Even Montalbano is surprised by the program’s instant success. Not to mention the grueling regimen necessary to cut weight and keep it off in order to compete. It takes an incredible amount of determination and sacrifice. The 106 and 113-pound wrestlers are both freshmen. Freddie Phillips at 106 and Derek Arias at 113 come to the program from different sports, Phillips from soccer and Arias from football. Yes, a 113-pound football player. Junior Mateo Gonzalez (120 pounds) and sophomore Tristan Fitzgerald (126 pounds) are so important that they have already been named captains for next year’s team. Joseph Rovito (132 pounds) is a freshman who has enjoyed instant success, having won eight times already this season. Evan Serrano is the team’s 138-pounder and he’s also a freshman learning the craft while competing. Javier Jimenez is the team’s 145-pound junior, another football player who came out for wrestling for the first time. Adrian Duranso is a 152-pound freshman who has “made the most progress of any wrestler we have,” said Montalbano. James Ontiveros is a senior who came out for the first time and wrestles sometimes at that weight class. Senior Tyler Williams is the team’s 160-pounder and the best wrestler on the team, owning an 11-1 record. Williams is recovering from a shoulder injury. Williams took first place in both the recent Mahwah and Secaucus tournaments. Sophomore J.J. Santos is the team’s 170-pounder. He was second at the recent Belleville tournament. Sophomore Giuseppe Salandra is the team’s 182-pounder. Montalbano said that Salandra dropped a considerable amount of weight to get to his weight class. Senior Rex Fukuda, another football standout, is the team’s mainstay at 195 pounds. Fukuda, who was third at the Belleville tournament, won his match against Becton Regional via a pin in less than a minute. Michael Fitzgerald, yet another football player, is the team’s 220-pounder and a senior with wrestling experience. But Fitzgerald has been injured and junior Andreas Gonzalez has been filling in. Senior Cesar Cordero, just one more from the gridiron, rounds out the starting lineup at heavyweight (285 pounds). Cordero recently took first place at the Belleville tournament. Montalbano has been assisted by coach J.J. Soprano of Belleville. If the kids don’t listen, then Soprano can just order to have them whacked. Hey, fuggedabout that pun. But it begins with the coach, who has truly created a miracle on the Hudson, just not quite as dramatic as Sully Sullenberger, but stupendous and remarkable all the same.